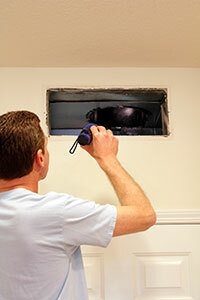 When people are considering the services of an air duct cleaning service, they usually have questions. Here are some of the most common. 1) How often should the air ducts be cleaned? They should be cleaned as often as the entire HVAC system needs to be cleaned. A better answer is that professional air duct cleaning should be done whenever you decide that your ducts need it. If you or someone else in the house is a smoker and if you have pets, you should consider having your ducts cleaned more frequently. If someone in the household is ill with a pulmonary or respiratory disease suffers from severe dust or mold allergies or has asthma, having your entire HVAC unit cleaned, along with your air ducts, frequently is a good idea. If you are moving into a new house, or have just finished remodeling your own house, experts strongly recommend having your ducts cleaned to help remove all of the construction dust from your house. 2) How Long Will the Home Air Duct Cleaning Take? It depends. The size of your house, the number of HVAC units you have, the amount of dirt and debris in your ducts and the number of service representatives working on your house all play a part in determining the amount of time. The best gauge is to go back to your three estimates and see the amount of time each contractor thought the cleaning would take. Their times should at least give you a general idea of the time it takes for residential air duct cleaning. 3) How Will the Cleaning Be Done? The cleaning will be done with several tools. First, there will be an inspection tool, such as a hand mirror and a flashlight or a remote camera that will let the contractor see what the air ducts look like. Second, the contractor will hook up a powerful vacuum cleaner to the air duct system. This vacuum cleaner may be mounted on a truck, or it may be portable. This vacuum cleaner creates suction so that the dirt being removed from the ducts goes to the vacuum and not into your house. Finally, the contractor will use a number of tools, like rotating brushes with soft bristles and hand vacuums, to loosen all of the debris in your ducts and send it to the vacuum.